Reflection exercises are classroom activities that I did not really get to experience until I was a college student. They were a much enjoyable part of my education and helped me integrate the practice in my personal and professional life. 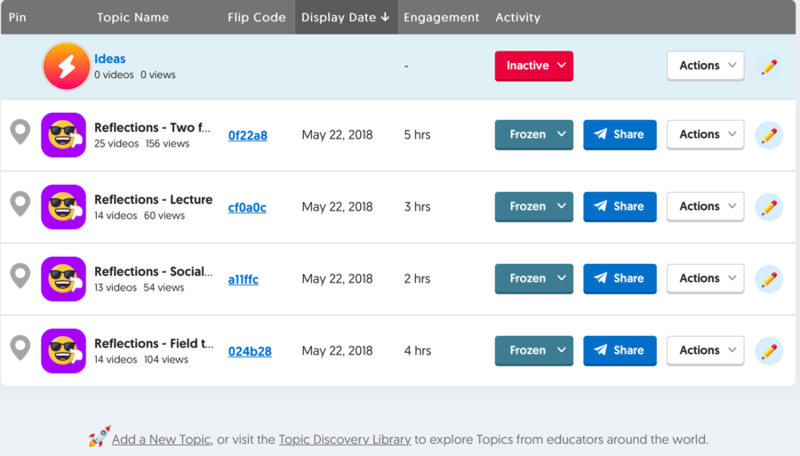 However, as an instructor, they have been an avenue of exploration most recently; and FlipGrid has been the tool that facilitated this exploration. These types of exercises ask learners to go over a past experience from the perspective of their present self (Mezirow 1990, Schon 1987, Brookfield 1987). The deeper one reflects on what they have been through, the more they learn about themselves and their relationship with the world. Reflecting, puts recollections of the experience into perspective; and is an opportunity for lifelong mindfulness and growth. Yet reflective essays are rather challenging to write well, and even quite uncomfortable for some. Attempting to decrease this intimidation factor has been a struggle for me before I tried incorporating a light-hearted activity tool, FlipGrid. On this platform, educators can create threads for video commentary and discussion in a digital classroom. The instructor creates a class first and then opens up threads for the topics of discussion. Students have access to an easy-to-use video recording application that they can download onto their mobile phones and other electronic devices. The platform caters to all levels of educational institutions, for online, blended or face-to-face classes; and integrates easily with other applications such as the Office suites (e.g. Microsoft Office 365) or cloud drives (e.g. Dropbox, Google Drive) to streamline assignment creation. My introduction to the platform was in a T&LI team meeting a few years ago. While I found it intriguing, I was not sure how I may be able to use it in my classes at first. But FlipGrid proved its value as a tool in my eyes, as I worked on designing an activity for the two-week international experience part of our International Marketing (MKT 410) class last spring. In this international experience, 15 students visit Germany for two-weeks at the end of the Spring semester as part of the International Marketing class. While in Germany they take classes at Duale Hochschule Baden Wurttemberg, from a very international group of instructors; visit various organizations and cities during their stay. They also spend time with the local students who are part of the same program, and experience college life in another country in its entirety. It is a complete experience that has academic, social and recreational activities, which leave students exhausted, and in awe, at the end of each day. The adoption of the platform, both for me and for the students, was quite seamless. Well, of course, the students use similar platforms regularly, Snapchat or Instagram stories are part of their daily lives; not mine though. I do not use the apps personally, or enjoy recording myself. Despite my reservations, the experience of creating the activity on the platform was easy and fun. I followed the instructions on the short tutorial and already had my very first assignment draft ready in a just few minutes. Students recorded their responses as short videos, had the opportunity to watch what others reflected on, and respond or comment, should they wish to do so. After watching the reflections, which showcased the variety of perspectives on the same experiences, I realized this group of students had created a video mosaic that consisted of unique pieces that came together to reveal the big picture of their shared-lived experience. 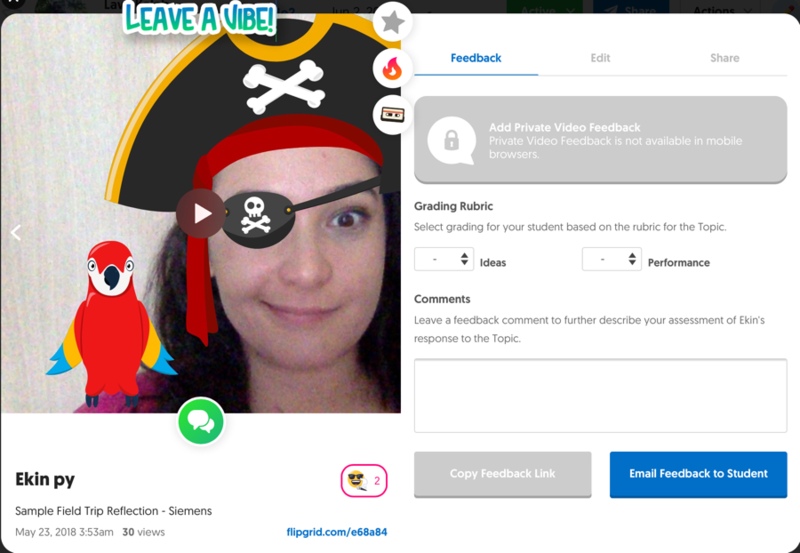 I figured, through an interactive and easy to use tool like FlipGrid, the instructor can co-create the tone and tenor of the assignment with the learners. More importantly one can appreciate the topic of reflection in its entirety and yet have the personal insight into each individual’s perspective in class. While the process of writing a reflective essay is an extremely valuable learning experience focused on the “self”, the capability of sharing those reflections with people, who are going through the same experience broadens the lessons learned and presents “other” perspectives to consider for the learner. They become more than self explorations, when shared. Exposure to others’ reflections, reveals alternative perspectives and showcase how we all may experience the same events differently. They can help build empathy and an appreciation for diversity of opinion. There are many ways of incorporating a collective reflection opportunity, have you found your favorite yet? Share it in the comments and let us see reflections from your perspective. Mezirow, J. (1990). How critical reflection triggers transformative learning. In J. Mezirov and Associates, Fostering critical reflection in adulthood (pp. 1-20). San Francisco: Jossey-Bass.